Drumcell was born as Moe Espinosa in Los Angeles’ San Gabriel Valley. Far away from the glamour and glitter of Hollywood, he cut his teeth growing up in a vibrant, culturally diverse neighborhood that still breeds inspiration for his work. 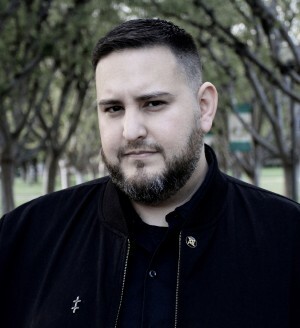 San Gabriel Valley is also where he and the Raíz brothers, Vangelis and Vidal, met and founded Droid Behavior in the early 2000s which lead to the infamous Interface warehouse series and lauded techno label Droid Recordings. A classically trained musician in his youth, Moe came to circulate around the Noise, Punk and Industrial scene, playing guitar and singing in various bands until he discovered the early ‘90s L.A. rave scene. That was when he got in touch with some of the heroic synthesizers of techno’s early years. His enthusiasm for those synthetic sounds lead to a career as a Product Specialist at Native Instruments and to independent musician and engineer work across Los Angeles. Some of his studio contributions include work for Alessandro Cortini of Nine Inch Nails, Maynard James Keenan of Tool, Douglas McCarthy of Nitzer Ebb, Gary Numan, George Clinton, Kool Keith, Qbert, and Cut Chemist. By then, Moe was chuffed to pursue his own productions. When he handed out his first self-produced, self- pressed vinyls at the Detroit Electronic Music Festival in 2001, he heard them being played from the festival stages the very next day. Since then, he has released original productions or remixed tracks on DROID, CLR, Electric Deluxe, Dystopian, Torque, Silent Steps, Blank Code, Ibadan, Detroit Underground, and much more. This style has caught the attention of many of the world’s top techno jocks, with strong track support from the likes of Luke Slater, Speedy J, and Chris Leibing. This style has also reached numerous prestigious international clubs and festivals. From Berlin’s techno mecca Berghain to the main stage of The Movement in Detroit to North American nightclubs like Output and Stereo to festivals across Europe, Latin America, Japan and Australia – Drumcell’s sound can be heard around the world. In 2016, Drumcell debuted his ambient project HYPOXIA on his experimental label BL_K NOISE. Inspired by science fiction soundtracks and the sounds of artists like John Carpenter, Wendy Carlos, Goblin and Vangelis, the Hypoxia release steps away from the dance floor and into a broader space of contemplative drama and rich texture. Producing infinite movement with his Buchla and Eurorack systems, Hypoxia all hardware performance has been heard at highly curated atmospheres from Berghain in Berlin to Brooklyn’s Greyscale Series at Output to pop-up concerts on the LA River. Drumcell explores and discovers the analogue world as much as the digital world of music production, to finally combine them into his very own raw, suspenseful and hypnotic style. Influenced by a myriad of music as well as science fiction and machines, he has developed an addiction to analog synthesis which has led to ceaseless experiments in his studio in search of new, mind-expanding sounds. As one of the most esoteric techno artists in North America, his sound disregards genre limitations and is everything but conventional techno.